Heavy calcium is a kind of white powder, which is high-quality limestone processed by grinding mill. Its main ingredient is CaCO3. Heavy calcium is commonly used as a filler, widely used man-made floor tiles, rubber, plastics, paper, coatings, paints, inks, cables, building supplies, food, medicine, textiles, feed, toothpaste and other chemical industry. As the filler serve to increase product volume, reduce the the production costs. Like 600 mesh, 800 mesh, 1000 mesh, 1250 mesh superfine heavy calcium powder, you need to use ultra-fine powder processing equipment. 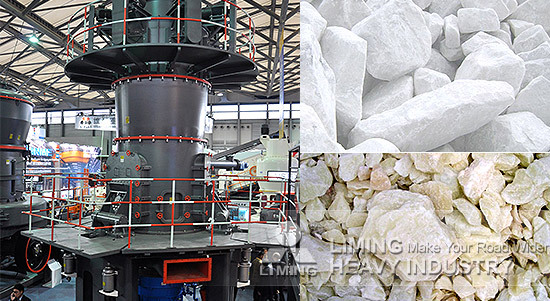 Liming Heavy Industry developed and producted the ultra-fine LUM vertical grinding mill. Its output capacity can up to 18t/h, is ideal for large-scale production of ultra-fine heavy calcium. If you want to know more about the Superfine Vertical Grinding mill and quotation, please click and contact customer service online, we will give you professional production solutions of tailor-made, and quotation.